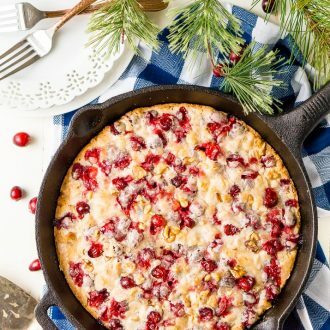 This Cranberry Cake combines sweet and tart in a delicious holiday dessert bursting with fresh red berries! A simple, old fashioned, single layer cake baked right in a skillet! 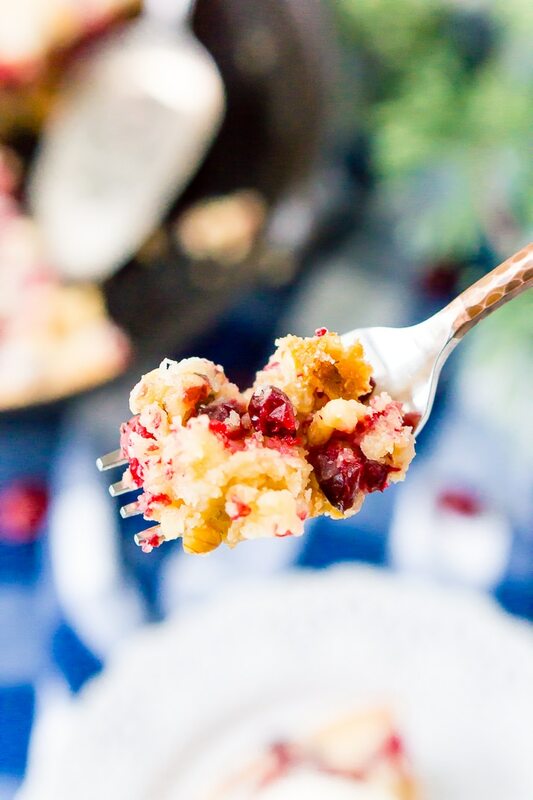 It’s amazing how quickly the holidays have gotten here, and while I am already missing the hot days of summer and the foliage of fall, delicious homemade desserts like this Cranberry Cake make the chilly nights a little easier to accept. We all know the best part about the holidays is spending time and sharing the joy with those you love. But I think those moments are even better with amazing food because the food is most definitely the second best part of the holidays. This is also the time of year when I use my castiron nonstop. I use it for everything from cakes (seen here) to cornbread to pork chops. Castiron has a way of making things taste a little cozier, don’t you think? 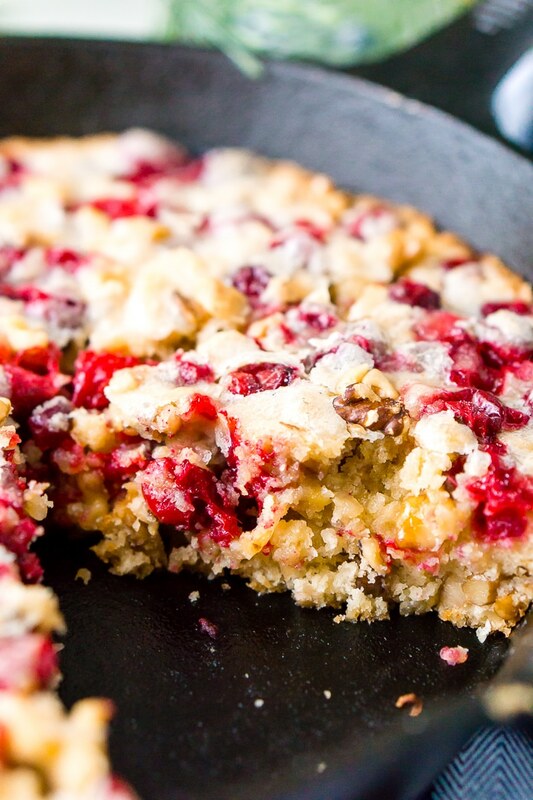 And nothing quite says Christmas time like the flavor of tart and juicy cranberries. 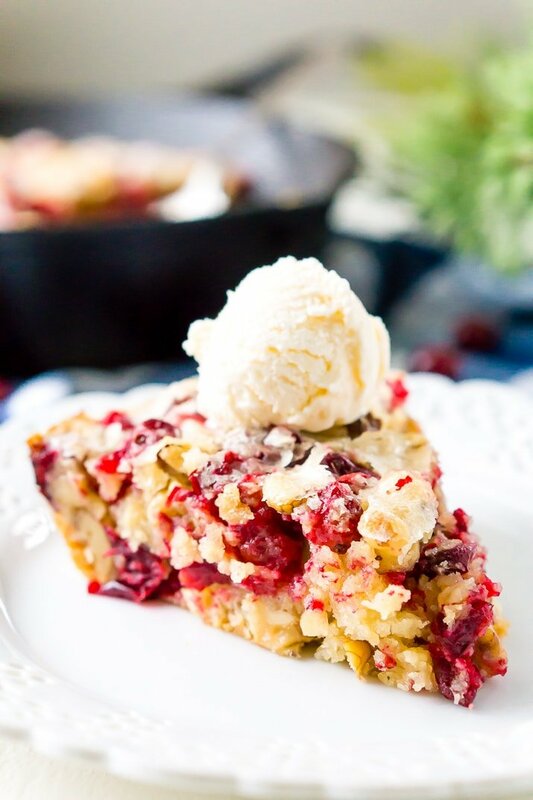 This Cranberry Cake is loaded with fresh cranberries and walnut for a delicious and easy dessert recipe! This cake, though humble, is still absolutely gorgeous and would make a fine addition to any holiday dessert table! Preheat oven to 350 degrees F. Grease an 8 to 10-inch cast iron skillet and set aside. In a large bowl, whisk together flour, sugar, and salt. Reserve about 3 tablespoons of the flour mixture to a medium-sized bowl and set it aside. Whisk in the melted butter, eggs, and extracts into the flour and sugar mixture. Add the cranberries and walnuts to the medium bowl with the reserved flour and toss to coat. Add to the batter and fold in until fully mixed. Add the batter to the prepared skillet and spread until evenly distributed. 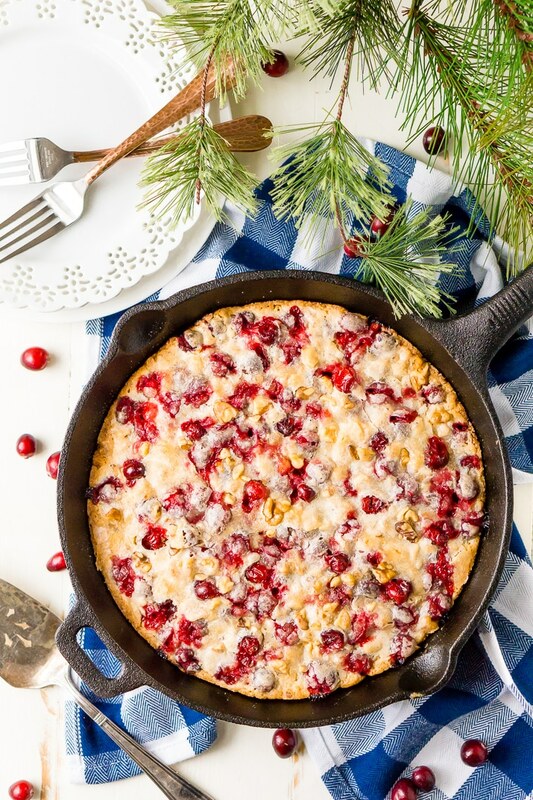 Tops the batter with a few extra cranberries and walnuts. Baked for 35 to 45 minutes or until toothpick comes clean from the center of the cake. Allow the cake to cool for 10 minutes before serving. Serve with ice cream or icing. 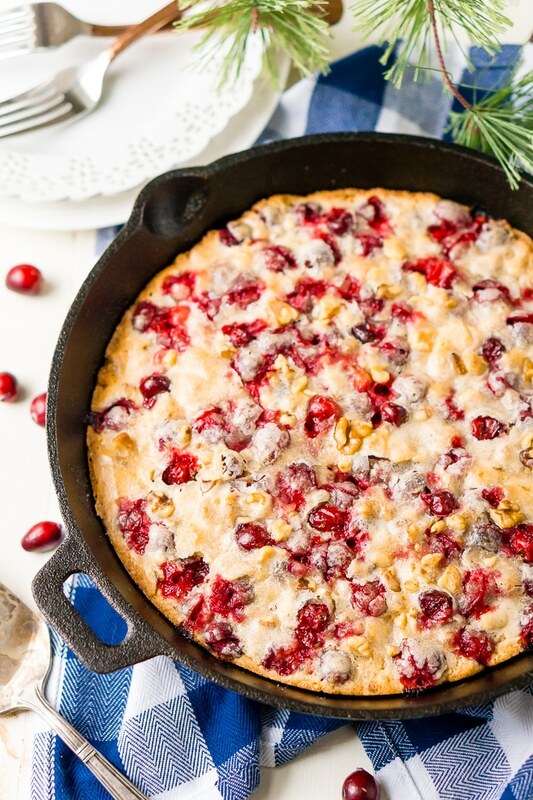 Pin this Cranberry Cake Recipe for Later! I’M MAKING THIS!! I adore cranberries- I’m already on my 2nd 2-lb bag of the season. This cake looks perfect! OMG, I love cranberries too and go through so many of them during the holidays! I hope you love this! I never thought to use almond extract with cranberries. But wow this cake looks like it’s about to burst with all those juicy cranberries, perfect! It adds a really night flavor when paired with the cranberries, helps tone down a bit of the tartness. My family really doesn’t care for walnuts. How do you think pecans would do with this recipe ? Hi Susan, yes, pecan should be fine and you can actually make the cake without nuts if you would like. Do you know how well this keeps? I am thinking of making it a day ahead of time for a party, but the only real way I can think of storing it is with some foil over top. Hi Delaney, You should be able to make it a day or two ahead with no problems. Just wrap in plastic wrap until ready to serve. Hello.. I don’t have a cast iron skillet. Think a 10″ springform would work? Hi Tom, that should work just fine. You may have to adjust the baking time slightly so keep an eye on it!